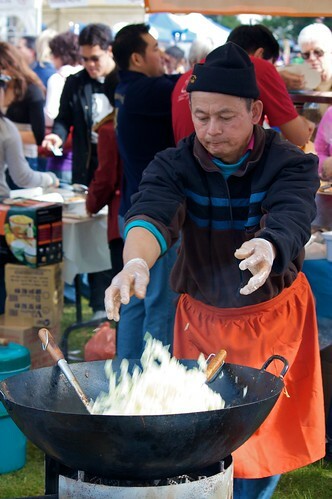 On Sunday we ventured down to the Asian Food Fair held on the Fremantle Esplanade. 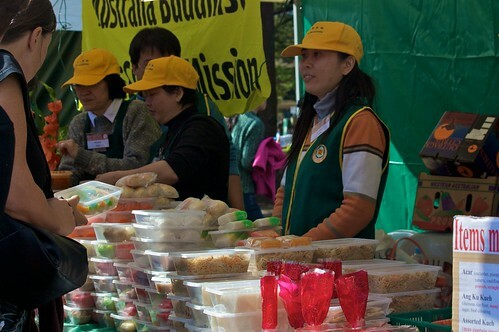 The fair was to raise funds for people aiding in Burma, organised by the Buddhist Society of WA. One of the things I love about a lot of Asian food is the way we categorise it. The fair advertised that vegetarian and non-vegetarian food would be available. 'Non-vegetarian' is not a term you see so much in Western restaurants, but you see it a fair bit especially in Indian restaurants. I love it because 'vegetarian and non-vegetarian' usually indicates there's some thought that's gone into the vegetarian food, and I have made this choice to not eat animal products but it's nice to have some choice in my food, too, which often people don't understand. I was at a workshop yesterday and seeing if there was anything I could eat (yes, I had told them in advance) and there was one thing on the menu that was probably vegan. I commented "at least there's one thing" and the guy I was with said, well, that's your choice. Which fills me with rage, like because I make this choice I should have to not eat delicious food? Anyway, there was lots of vegetarian and vegan food at the food fair. The line for the dosai was sadly very long, so although I could smell it as we wandered past we walked on by, I will make it up to myself by going for dosai sometime soon. D and I shared a fairly average miscellaneous Indian curries and rice (it was a bit cold), and some mee goreng when the Buddhists ran out of char kuay teow. When I have been away too long, I forget things, and the look the guy gave me when I asked if there were eggs in it and he said, no, it's strict vegetarian was a moment of oh, of course, how embarrassing for me. We took home some mock chicken rice, which D and I fought over for breakfast (we both ate it), and some bacheng, which we have yet to eat but which will hopefully be delicious. The chicken rice was a great way to start the day, and also had some char siu which was a surprise delight, and I wish I could buy it more regularly. The great thing about Chinese cakes is that they are often vegan by default, made only of flours and nuts and things, but I wasn't in the mood and D doesn't like them, so sadly we passed those by. 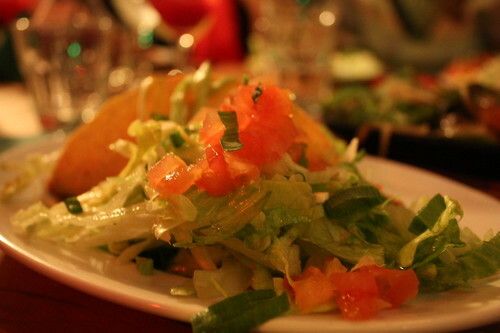 As part of my current obsession with Mexican restaurants, last week we went to Zapata’s in Fremantle. The menu is fairly extensive, and though I found my portion size to be a little on the small side the prices do reflect that, so next time I’ll probably order something a little more expensive. M ordered the fajitas, for example, which are among the more expensive items on the menu and he was unable to finish his meal (though he really wanted to). 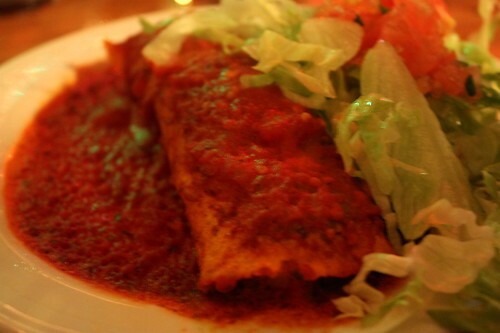 The spicy was spicy, but my enchilada was soft and delicious and everyone (all ten of us) enjoyed their meals, and I will definitely be going back. On Tuesdays they do cheap tacos and cocktails, I understand, and everything that we wanted vegan came out vegan. They are able to do separate billing if you let them know before you order. I can't remember how they were for gluten-free options. My family loves talking about food, and I am no exception to this. We love talking about restaurants we’ve visited since last we spoke, food we’ve bought and food we’ve made and it’s such an important part of our lives. My parents like to talk about this Indian restaurant, it’s tiny and rarely very busy. The chef is an accountant by day, and a chef by night. His three children wander about the restaurant working as waitstaff. My mum says to him, you would get more business if you advertised at all! but he protests. He likes it this way, it’s a hobby. He catered for my father’s birthday this year, and when my parents didn’t visit for three weeks the chef started to fret, assumed that we must have been disappointed. Last night we visited and drastically over ordered. 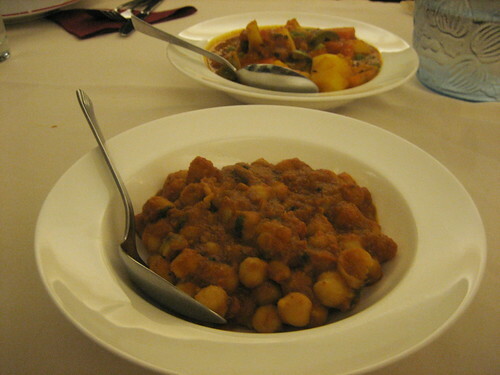 We ordered a mixed vegetable curry, a palak aloo and a chana masala (I thought of you, SJ). My parents also ordered some meaty dishes, hence the over ordering. We had some breads, too: the roti was a bit whatever, but my sister liked the naan and the chana came with bhatura, which our waiter described as naan bread that’s been covered in oil and fried instead of baked tandoor. It was so tasty, really great, it was kind of like a donut and so oily and crisp. 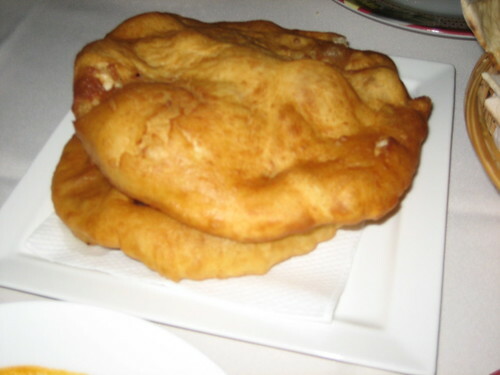 After I got home I googled for a bit, and I’m now concerned that it might have had yoghurt (some recipes do, some recipes don’t), so my recommendation for the bhatura is cautious due to that, but I’ll ask next time and we’ll see. I didn’t think to ask this time because he described it as naan batter. The palak aloo was also pretty fantastic, combining two of my favourite things (potatoes and spinach) into one creamy, tasty dish. The service is very laidback (the chef's son argued with me about both what time we'd booked and how many we'd booked for in a very 'whatever' sort of way), but it is very fast, and they're super helpful and friendly. It was my birthday recently. 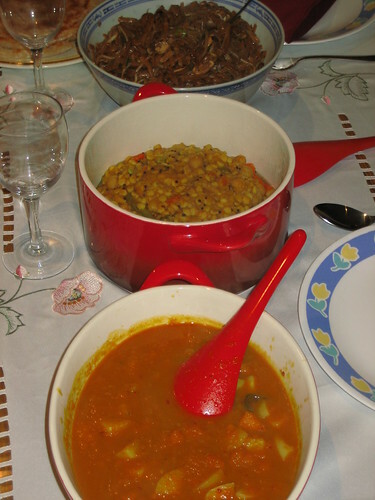 On Friday D’s mum tried some new things, a green split pea soup and a kumara peanut coconut thing. I saw her recipe books lying around but I forgot to note down which ones they were, so I can’t tell you where these were from. The peanut thing was really tasty. This doesn't mean that the soup wasn't tasty also (I know that she will read this and fret)! But the peanut thing was the highlight. On Sunday my mum cooked a whole lot of my favourite food, a sweet pumpkin curry, a chunky dahl (filled with vegetables) and pad thai. 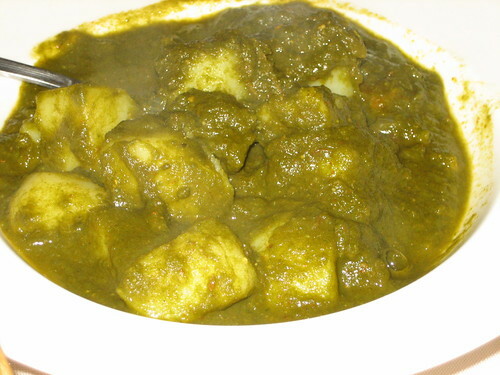 Not pictured: delicious, flaky roti. 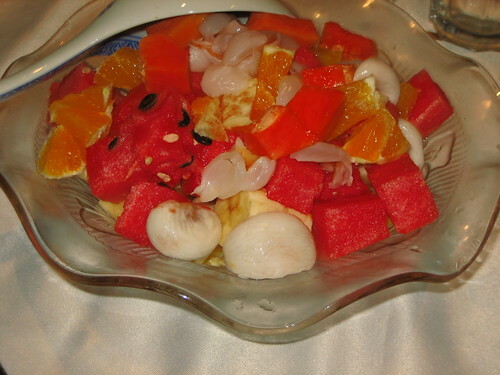 For dessert we had a fruit salad filled with my favourite fruits, watermelon, papaya, banana, lychee, orange, mangosteen. Not exactly fruits that are in season, but fruits I love a lot. If only there was also rambutan! We also had some lime sorbet and some mango sorbet from a local store. The lime had this delightful, tart taste, I really liked it. 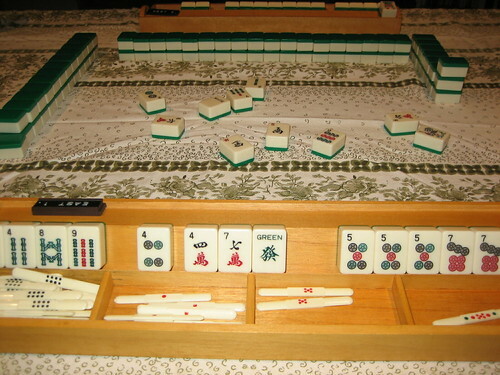 Then we played mahjong, and I felt really lucky to be fed all this food and then able to play my favourite game (which is played at birthdays, weddings, etc, so appropriate to the day). Since the success of last week’s pastry-based experiment, I’ve been thinking about the other delicious things I can make with puff pastry. After many days of deliberation, I decided the number one priority was to try making apple danishes, a treat that I have long missed. This recipe is fast and simple, and quite possibly going to be a great new addition to dessert times at dinner parties. Peel and dice the apples. I like to use Granny Smiths for baking and desserts (though not for fruit salad). Melt a tablespoon or two of margarine in a pot, add the apples, cinnamon, nutmeg and brown sugar. 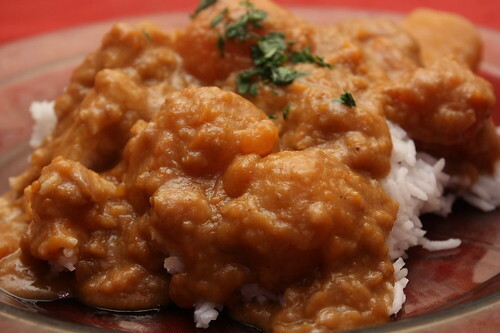 Allow to simmer for fifteen minutes. The apples should be soft, but should retain their shape. Remove the pot from the heat, and leave to cool. Cut the puff pastry in to four squares. Depending on how much mixture you like to use and how big the apples are, you will need between four to eight squares. Spoon the apple mixture into the centre of each square, I think two or three tablespoons is about right. 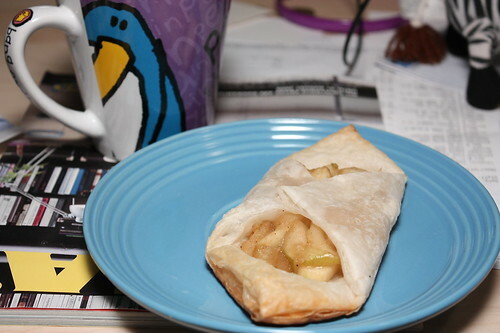 Fold two opposite corners to meet in the middle over the apple mixture, press to seal. Brush with melted margarine. Bake at 220C for 15 to 20 minutes. Eat hot, but remember that apple mixture burns! I always learn that one the hard (but delicious) way.